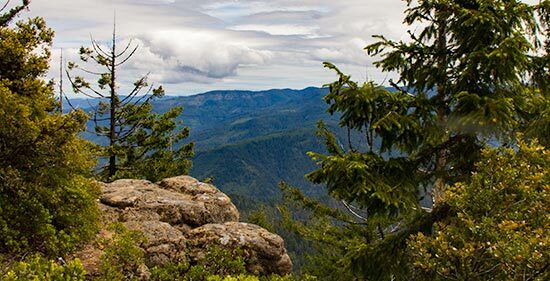 The 36,000 acre Wild Rogue Wilderness is located partly on the Rogue River – Siskiyou National Forest and partly on lands managed by the Bureau of Land Management in southwestern Oregon, USA. 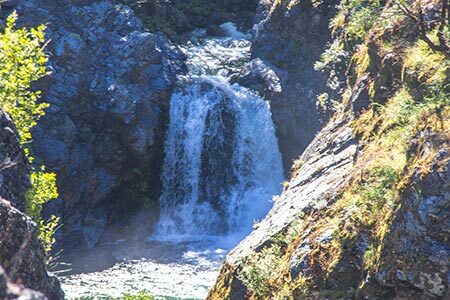 It’s on the north side of the Rogue River between the towns of Agness to the west and Galice to the east. 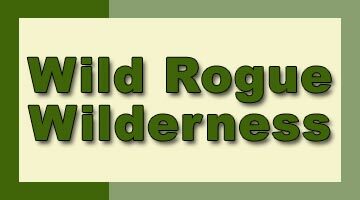 The entire Wilderness is circled by the Wild Rogue Wilderness Loop Trail, a combination of four trails. 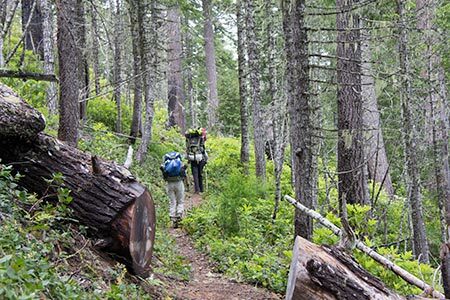 The loop offers a great backpacking adventure that can be accomplished in just a few days. 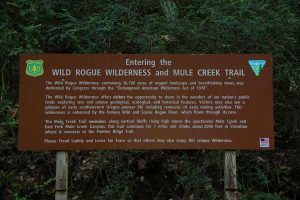 We began and ended our hike at the Mule Creek Trailhead at Tucker Flat Campground right at the edge of the Wild Rogue Wilderness, but the adventure begins on the drive into this remote area. We drove in from the east off of I-5 at Merlin, Oregon (Exit 61). The road heads northwest and north from Merlin for 23 miles to the Grave Creek Bridge. Hikers on the Rogue River Trail and rafters heading down the river typically start at this bridge. 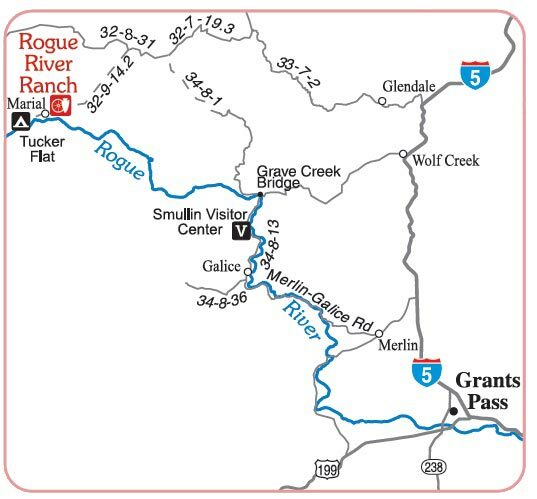 This Bureau of Land Management Map shows the route to the Tucker Flat Campground and the Mule Creek Trailhead. Not to scale. Click for a larger version. Immediately across the bridge, turn left on BLM Road 34-8-1, The Marial Back Country Byway. 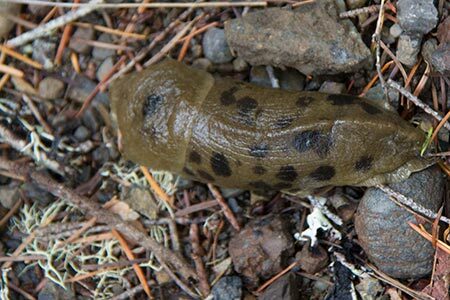 There are occasional signs that, if you see them, will lead you to the Rogue River Ranch – near the trailhead. Drive five miles to BLM Road 33-8-26 and keep right on Road 34-8-1. This is where the pavement ends. Continue three miles to the junction with Road 33-8-13. Keep left and continue on Road 38-8-1 for another eight miles to Road 32-8-31. Turn left on Road 32-8-31 (back to pavement). In five miles you will come to Road 32-8-9.2. Bear left to continue on Road 32-8-31 for another mile. Watch for signs indicating the route to Marial. Turn left on Road 32-9-14.2 for 15 miles. The road will turn to gravel and lead you past the Rogue River Ranch, on your left. Bear to the right at a Y-Junction that leads into the campground and trailhead. 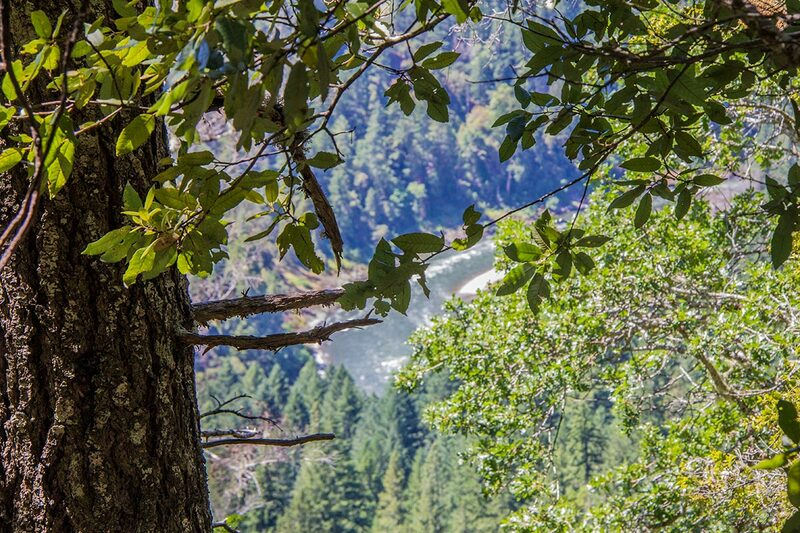 It is quite a beautiful drive through the forest with frequent panoramic views across the Rogue River watershed. Be aware that the road is often less than two lanes wide and it will be a slow drive. Recreational vehicles are NOT recommended due to the winding, narrow roads. We only saw a couple of vehicles on the road, but one never knows what might be around the next curve. 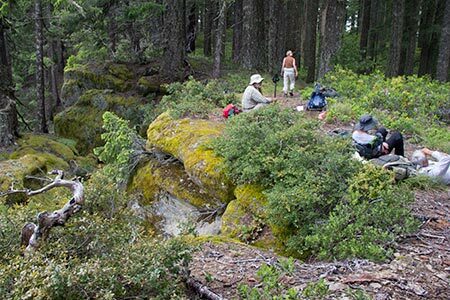 The Klamath Basin Outdoor Group hiked the Wild Rogue Wilderness Loop over four days, June 15 through June 18, 2017. 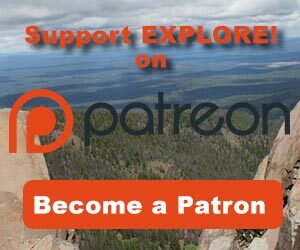 We drove to the trailhead from Klamath Falls on June 15 and hiked most of the Mule Creek Trail that day. 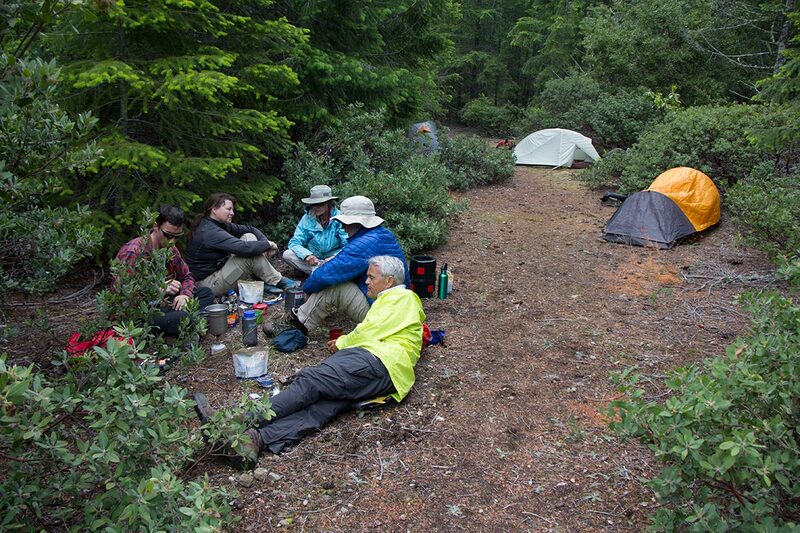 We made it back to the trailhead on June 18 with plenty of time to drive back to Klamath Falls. We recorded the length of the hike at right around 30 miles. Others say it’s between 27 and 30 miles. The vertical ascent, and descent, is around 4,585 feet. 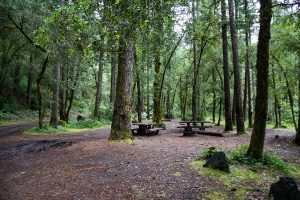 If you are bringing people along that plan to camp, rather than hike the loop, the Tucker Flat Campground offers six free campsites (first come, first served) for tents only. There are picnic tables, grills and vault toilets available during the May through October season. 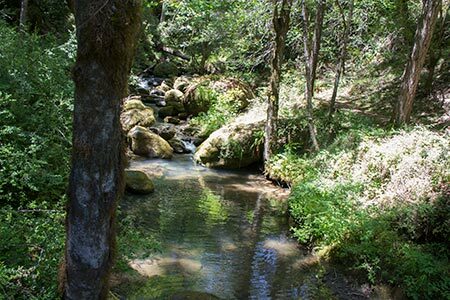 Bring your own water, plan to filter water from Mule Creek or get water at the Rogue River Ranch, operated by the Bureau of Land Management. 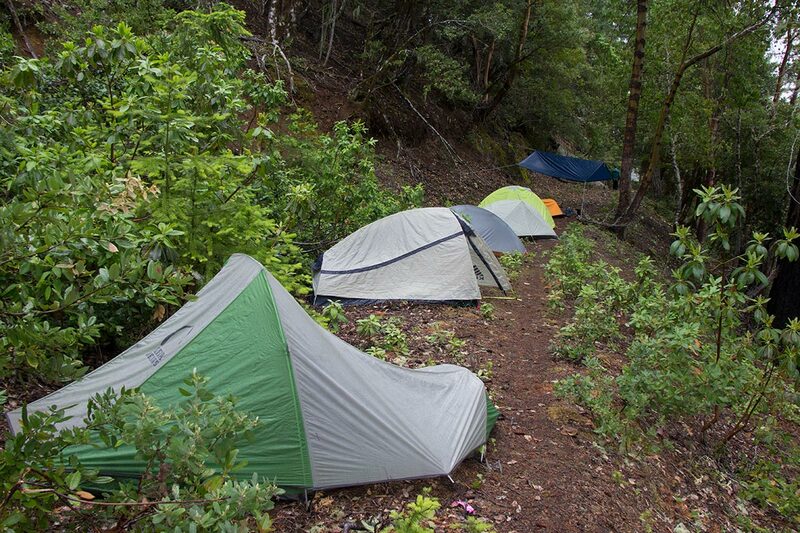 Camping may also be available at the Rogue River Ranch, but check with the caretakers first. The Marial Lodge is nearby and is available by reservation only (Phone: 1-541-474-2057). It is open from May 1 to November 15. You can drive to this lodge and it is along the trail, so you can start your hike there or the trailhead at the Tucker Flat Campground. 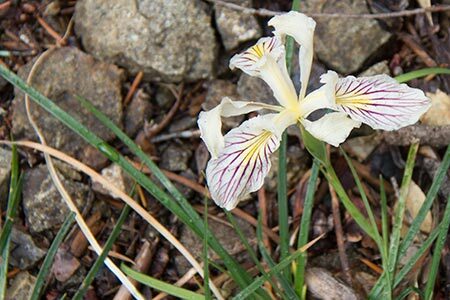 Taking the loop in a counter-clockwise direction, starting with the Mule Creek Trail, is recommended. 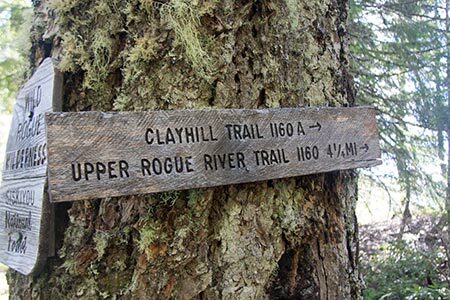 That’s mostly because the Clay Hill Trail from Panther Ridge to the Rogue River is very steep and you are more likely to want to hike down the hill than up it. 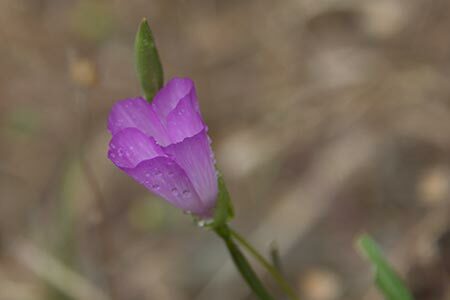 The Mule Creek Trail starts at the upper end of the Tucker Flat Campground and follows Mule Creek and the West Fork Mule Creek upstream for about 7.4 miles. 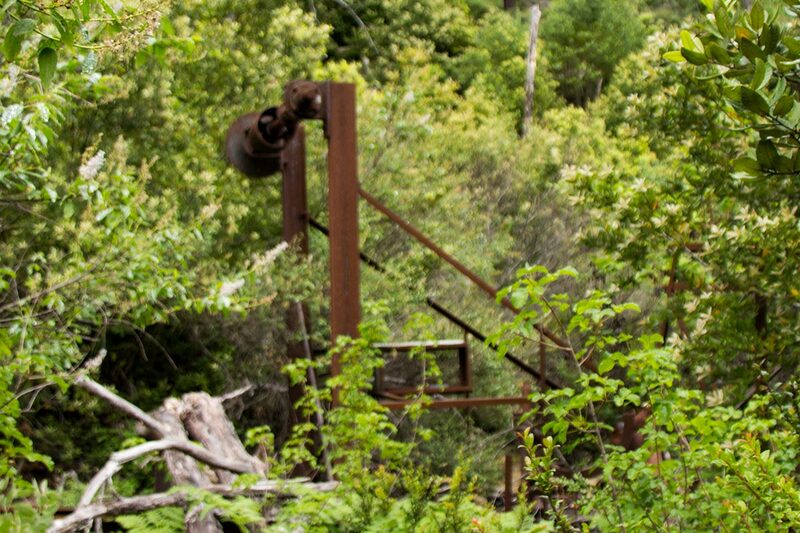 It was originally constructed in the early 1900’s and was used by miners and settlers to bring in supplies, by mule. Along the trail you will see some old mining equipment still sitting where the miners left it. The trail is uphill as it climbs to Panther Ridge. There are two stream crossings that may be impassable with high water early in the year. When we hiked the trail in June the snow was gone and the water had receded to passable depths. It’s a matter of removing boots, donning water shoes, carefully crossing the creek then getting boots back on to continue the hike. The process does slow forward progress, so don’t be in a big hurry. After the last stream crossing, water is harder to find. When we hiked the trail there was surface runoff that could be filtered for use in a couple of places. The trail is narrow until farther up the mountain where it appears to follow an old road. The narrow portion of the trail crosses several areas of decomposed rock that tends to slide down the hill and across the trail. Be particularly careful at these places because what may seem to be the edge of the stable trail may in fact be loose gravel that will slip from under your feet. It’s best to walk well away from what appears to be the edge of the trail. It was getting dark so we camped on a wider portion of the trail where water was available, before we got to the best campsite. The next morning we came to the crossing of the West Fork Mule Creek. The crossing itself is a low log bridge. On the south and west side of the trail is a nice flat spot for several tents. 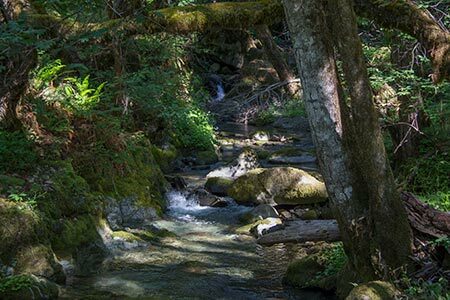 If you can get there on your first day, it’s the best place to camp on the Mule Creek Trail and water should be available year around. 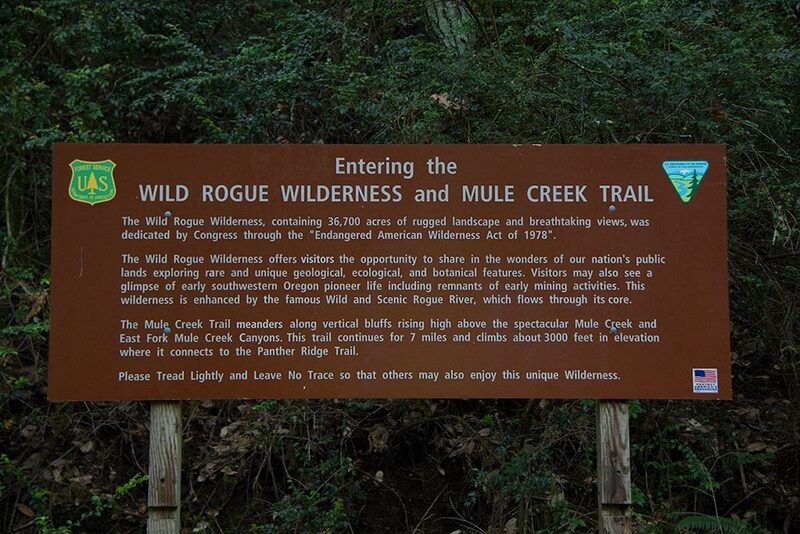 The Mule Creek Trail ties into the Panther Ridge Trail a short distance beyond the West Fork of Mule Creek. 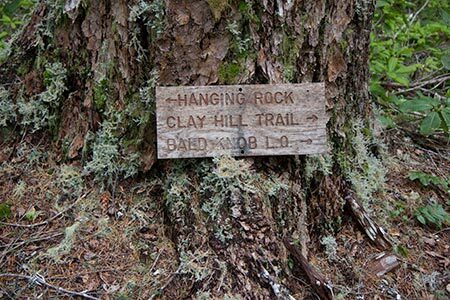 Panther Ridge Trail runs about 8.9miles from the Mule Creek Trail to the Clay Hill Trail. Although it is on a ridge, the trail is not flat. In fact some in our party considered the hike on the ridge trail to be more difficult than the hike up Mule Creek. There are some steep uphill stretches interspersed with some fairly flat segments. 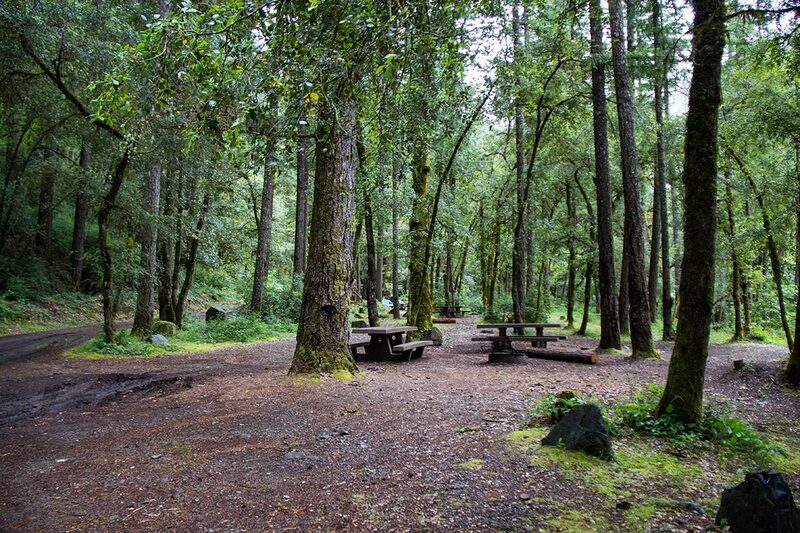 There is a trailhead with plenty of space for camping at Forest Road 5520 near Buck Point. Water is available where Buck Creek crosses the road less than a half mile from the trailhead. If you want to hike farther than the last Mule Creek crossing on your first day, this would be a great camping spot. There are no opportunities to get water on Panther Ridge beyond this point, so load up. Beyond the trailhead at Road 5520 are some great views across the valley and Hanging Rock. Hanging Rock is about 0.3 miles off of the main trail to the east. It is a vertical cliff overlooking the valley far below. 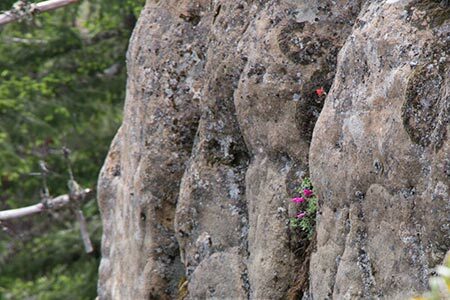 It is quite popular with visitors that can reach it from a trailhead on Road 5520-140 a short distance northwest of the rock. There is space to camp, but no water nearby. 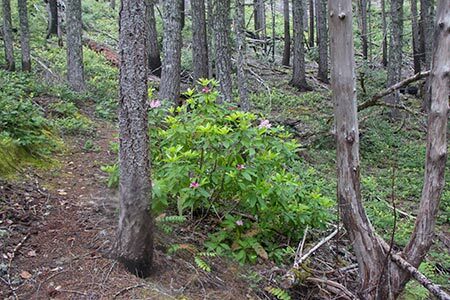 We continued farther along the ridge, enjoying the rhododendrons that were flowering under the forest canopy. We spent our second night at a point a mile or so northeast of the Clay Hill Trail. Again, there is no water readily available, so be sure you get enough earlier in the day. 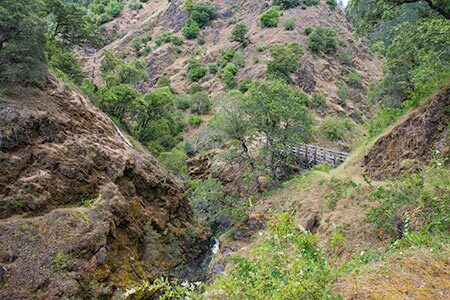 The Clay Hill Trail is about 3.1 miles from Panther Ridge to the Rogue River National Recreation Trail. It’s all downhill and is very steep. The trail offers a lot of switchbacks, but even on those segments the trail crosses a lot of contour lines quickly. In my case, the steep downhill trail really wore on my knees requiring frequent rest stops. I found it to be the most difficult part of the whole loop for that reason. Given the steepness of the terrain, there are few, if any, opportunities for camping along the Clay Hill Trail except near the top of the trail. We finally came to water on Clay Hill Creek, just above the Rogue River near Clay Hill Lodge. 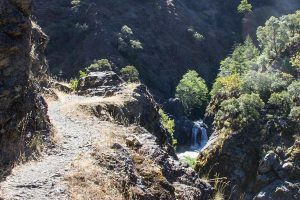 Once on the Rogue River Trail, the hike is much less strenuous. Although we are heading upriver, the trail is nearly level. There are several camping opportunities along the way. The Powers and Gold Beach Ranger Districts map shows some good places to camp, although you can camp anywhere you want – except on private land. We spent our last night on the trail right on the river just upstream of Paradise Bar. We didn’t see anyone along the other trails, but as soon as we reached the Rogue River Trail we began see lots of people. Some were hiking the whole trail and others were out for the day. In places along the river the trail is cut into the canyon wall with a narrow tread and a steep drop to the bottom of the canyon. Caution is required when passing others or when navigating over trees that may be across the trail. At one point we came upon a dead deer that had apparently fallen from above the trail. The views of the river and the canyon are much different from the views from Panther Ridge, but equally majestic. 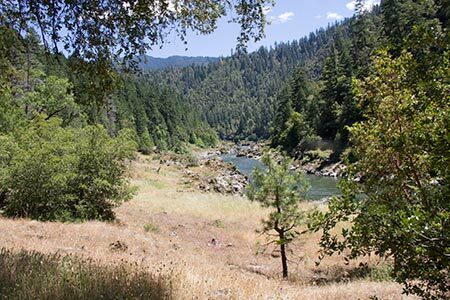 Our video offers a scene of the road into the area and a look at the historic Rogue River Ranch. Next we move to the trailhead and begin our hike up the Mule Creek Trail. 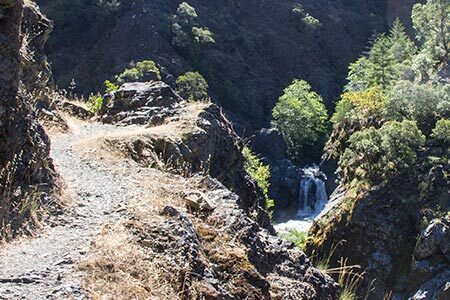 As we move beyond Mule Creek to the Panther Ridge trail, we see a California Mountain Kingsnake then some great views of the Rogue River watershed. 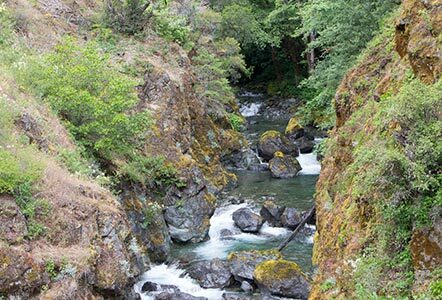 Finally we drop down to the Rogue River where we finish our adventure on the Rogue River National Scenic Trail. For higher resolution, see our YouTube version. 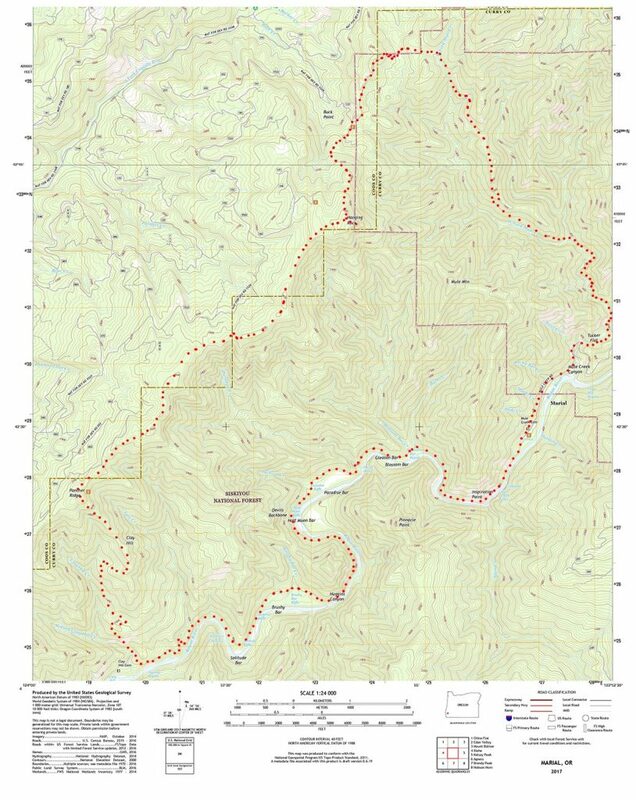 The official map that covers this area is the Powers and Gold Beach Ranger Districts map published by the U.S. Forest Service. We picked up a copy at the Smullin Visitor Center at Rand, three miles downstream from Galice on the Galice Road. It cost $10 in a waterproof version – cash only, no change available. 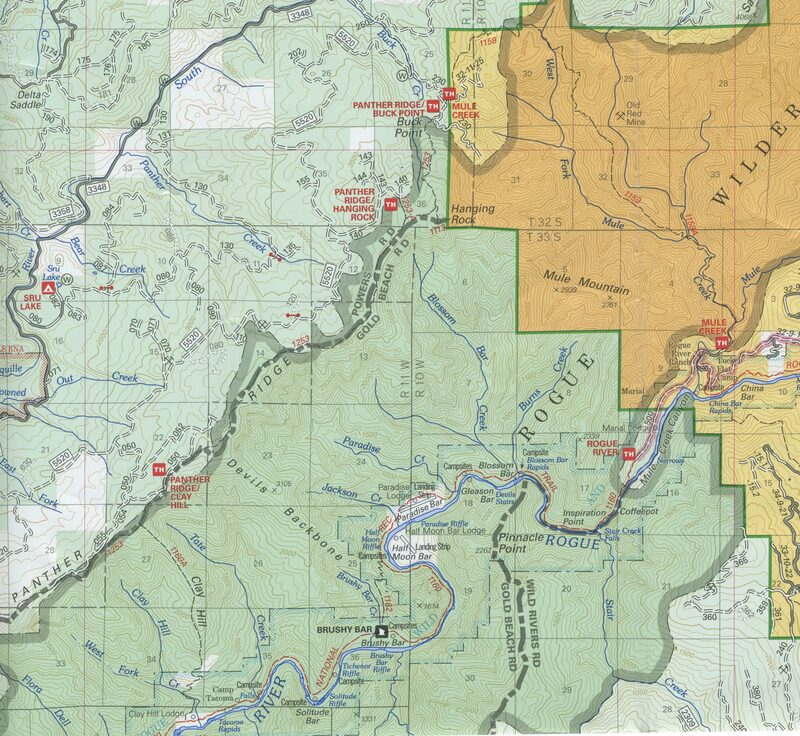 A reproduction of the portion of the map that includes most of the Wild Rogue Wilderness and covers the loop trail is below; click for a larger version. I have added no notations to this map. North is at the top and the squares are section lines – about one mile on each side. We started at the Mule Creek Trailhead shown on the right side, middle of the map. 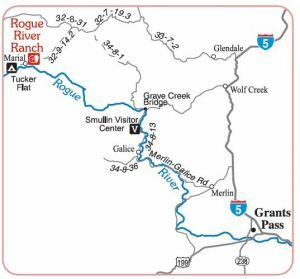 The map shows Trail 1159 up Mule Creek to Trail 1253 along Panther Ridge to Trail 1160A down Clay Hill to Trail 1160 along the Rogue River back to the starting point. 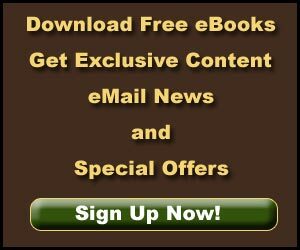 All video, text and photos are by Jerry Haugen, your pathfinder, and ©2017 Global Creations LLC. The maps were developed by the indicated Federal agencies and are in the public domain. The music in the video is Mountain Spirit courtesy of Digital Juice. Great job;great hike. Glad Bill organized so we could experience it.